I arrived at Schiphol around 7:15, leaving me plenty of time for the lounge before my delayed Delta A350 departure. At Amsterdam, Delta passengers may use KLM’s international business class lounge, the Crown Lounge Number 52. Because of its status as KLM’s flagship hub lounge, the Crown Lounge is enormous. Or at least it’s supposed to be, as Rocky’s review from 2013 suggests. Unfortunately, a renovation project through next March means a smaller footprint, and significant crowding during peak hours. Note: this post is part of my trip report series about my quick weekend trip to Belgium. Click here for the trip report index and introductory post. Concourse F of the Main Terminal. As a point of reference, most Delta flights depart from Concourse E. Follow the signs for Lounge 52 after passport control, then head up one level as you reach Concourse F. Note: if continuing to the US on Delta, the airline offers a passport/document check outside the lounge entrance. Or, you can complete the check at “gate” E1. The check outside the lounge didn’t seem to save any time. However, that’s perhaps the fault of an exceptionally verbose security officer. Also note, if you receive the dreaded “SSSS” on your boarding past, you will need to report to your gate at least one hour prior to departure. It took less than five minutes to reach the E gates, but still, make sure to allow enough time. KLM and SkyTeam business class passengers can access the lounge. KLM also provides access to Flying Blue Platinum, Gold, and SkyTeam Elite members flying any class of service plus one guest. 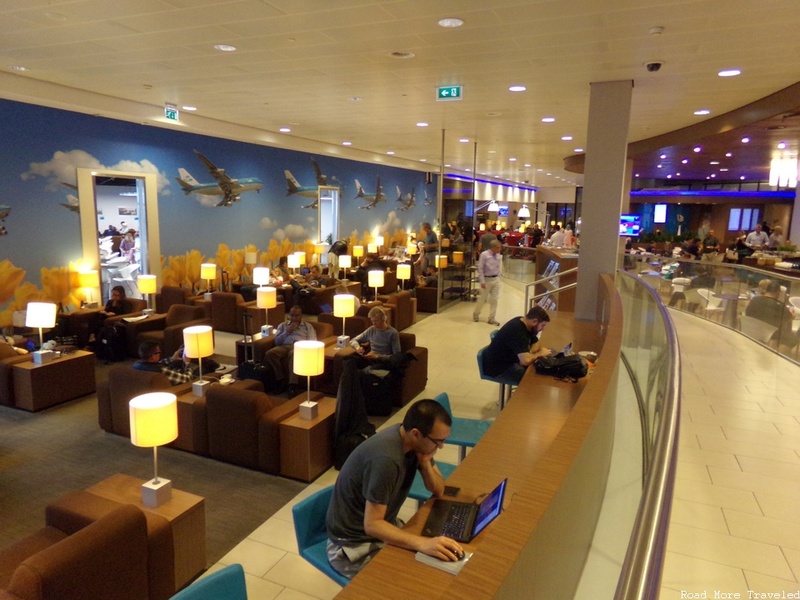 Gold and Platinum members may also use the lounge when flying on a KLM codeshare flight. Any passenger can access the lounge for a fee, I believe €49. Note that because of the renovation, KLM prohibits guests between 7:30 am and 11 am daily. This lounge specifically caters to passengers on non-Schengen flights. Passengers on Schengen flights can use the Crown Lounge 25 instead, located in the D gates. From the central check-in area, the lounge apparently used to split into two long wings. However, it seemed like the one to the left was mostly closed due to the renovation. Near the check-in area is a MASSIVE central seating area, with a few red loungers. Mostly, though, you’ll find the typical 2×2 lounge seating. Despite the large number of seats, finding an empty one proved difficult. A common theme throughout the lounge, unfortunately. This also gives you a pretty good idea of the decor, which is consistent throughout the lounge. I found it modern, while avoiding the cold minimalist tones becoming prevalent in airline lounges these days. The furniture does show its age a bit, though, and could use a refresh. I mentioned the left side of the lounge, which was only partially open. This area did have some nice ramp views, but I couldn’t find a window seat due to the crowding. This side mostly features your typical 2×2 seating. Anyway, off to the side is some cool artwork featuring the famous Delft houses. Unfortunately, it appears that the collection of KLM mini-houses is no longer there. Perhaps these will return once the renovation is complete. Straight ahead is the lounge’s main dining area. The breakfast selection wasn’t fancy, featuring meats, cheeses, breads, hard-boiled eggs, and fruits. Honestly, I found this a little underwhelming. I’d expect a hot option or two in an airline’s flagship lounge at its primary hub. The Crown Lounge also has a good selection of beer, wine, and spirits. Too bad it was 8 am, as I really wanted to try a couple of the Bols products. Finally, there is a decent espresso machine. Just past the food station is a ramp/stairs to the second level. From here, you can see just how large – and crowded – the lounge is. This view also shows the bi-level dining room, if you prefer to sit and eat at a proper table. Here you can also see a cool mural of KLM aircraft flying over a tulip field. There is another food station behind the upper dining area. The selection is exactly the same as the one downstairs, however. Upstairs is a rather long row of seats that stretches all the way back to the smoking room. I ended up picking a seat in this section. The downstairs section was far too noisy due to the crowding. I found the upstairs area noticeably quieter, though crowding was about the same. And of course, more of the odd-looking red Ikea chairs. In front of the smoking room is a business center of sorts. I say of sorts, because while there are ample workspaces, I found only one copier/printer, and no desktop computers to use. Nevertheless, this is probably your best bet to find a seat, especially if you want some quiet. I also found a real throwback to the past – pay phones. I found plugs plentiful throughout the lounge, but don’t forget to bring an adapter if your devices use non-Euro plugs. The lounge offers free WiFi, which I found adequate, if not particularly fast. I wanted to like the Crown Lounge 52, but it’s simply too overcrowded, making it hard to enjoy. I also found the food selection mediocre, especially since KLM bills this as its flagship lounge. It’s certainly better than most domestic lounges, but I wouldn’t arrive early for it, at least until the renovation is completed.